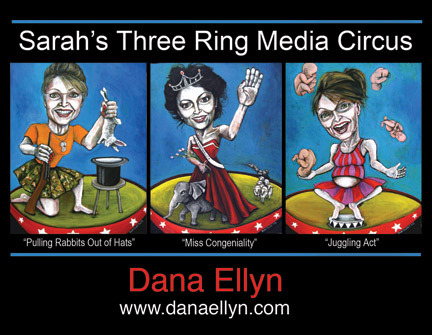 Dana Ellyn's "Sarah's Three Ring Media Circus"
Washington, D.C. may run decidedly blue in elections, and you may have to walk past 25 blocks of Obama canvassers before you even spot a McCain sticker here these days, but that doesn't mean we're all in agreement in this city. Home furnishing and design store Skynear, located in Adams Morgan, recently asked artist Dana Ellyn if they could hang a few of her paintings. 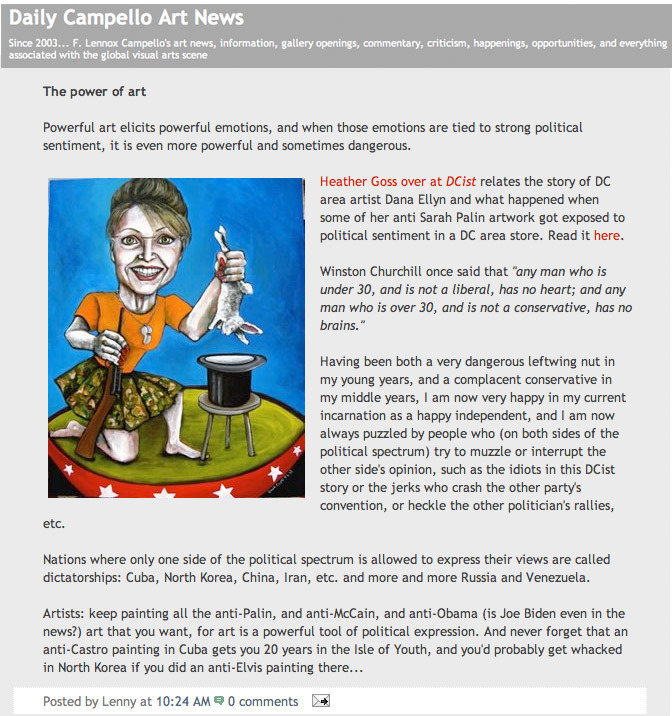 Ellyn is a popular local artist, having shown her work in a number of venues, such as Warehouse, Gallery Neptune, Long View, and most recently in the Brushfire sponsored show at Gallery Plan B, from which the three pieces in question came. 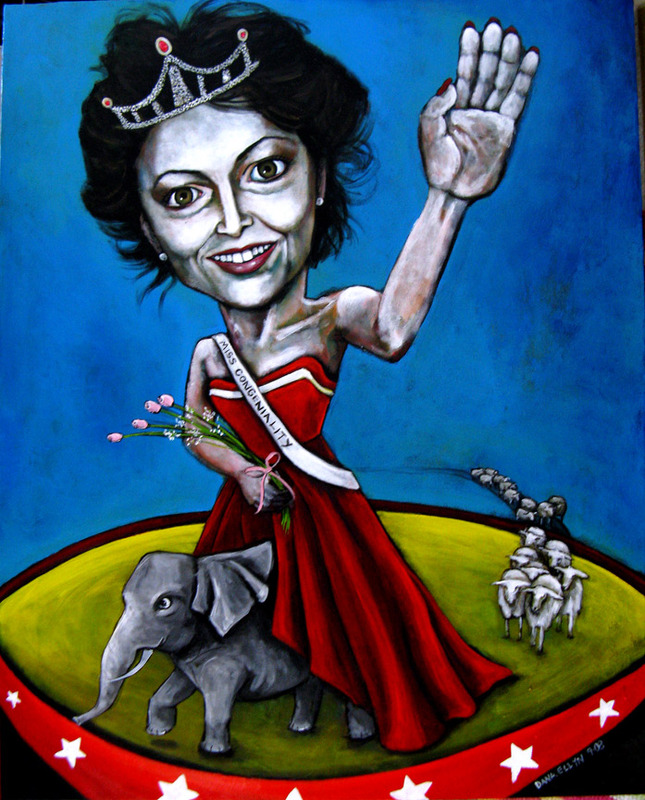 Her bold colored caricatures, which often focus on current events, are intentionally provocative. And this time, it seems, they're making some people downright violent. Owner Lynn Skynear asked Ellyn if she could hang some of her paintings in the run-up to the election, and Ellyn sent her three Gov. 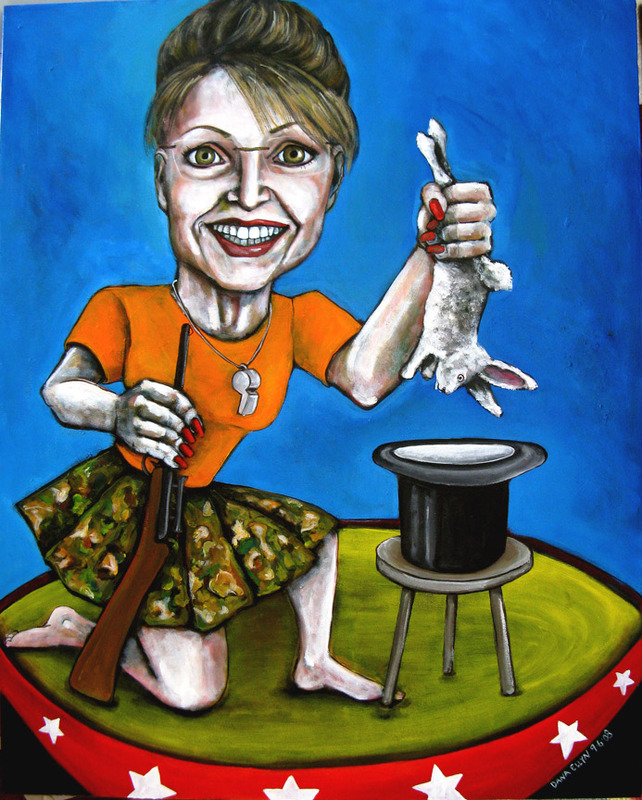 Sarah Palin paintings to put in their window: Miss Congeniality (with her sheeple), Pulling Rabbits out of Hats, and Juggling Act (pictured at right). Friday afternoon, Ellyn got a call from Skynear employee David Stulajter. The store is close to a number of other locally owned shops (a hair dresser, etc. ), and these neighbors started bringing word to him about threats regarding the paintings. We spoke with Stulajter, who said there were quite a few people who reportedly talked of "breaking windows" and vandalizing the paintings, though it's unclear if they were direct threats or passive aggressive "warnings" that, ahem, things like that happen. 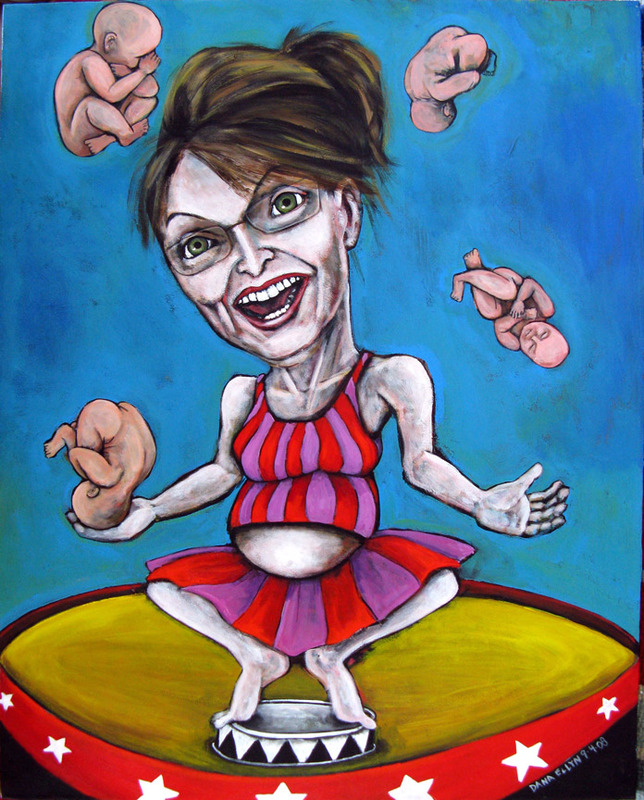 One particular Skynear customer, who had returned to order furniture, noticed the new paintings on the wall and told Stulajter he was "quite offended," particularly by Juggling Act, in light of Palin's baby with Downs Syndrome. He left without purchasing anything, and they don't expect him back. Stulajter doesn't lament the lost sale, stating, "it's art!" While threats of violence go on behind their backs, there are also folks who like the work, finding them "funny and clever," and in fact, Ellyn already has an offer on Miss Congeniality. Nevertheless, the store is worried about the safety of the artwork, so they've moved them to the second floor, away from the windows. In that location, Stulajter hopes, the store's alarm would scare anyone away before they got that far.